Will not dull or haze aluminum. This industrial strength, organic salt formula is safer than traditional acids at instantly removing brake dust, scum, salt water buildup, corrosion, rust stain, calcium, lime, tarnish, grease and oil & water stains. Works great on diamond plate. 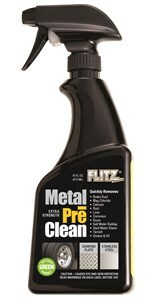 Remove the surface grime, corrosion and buildup with the Flitz Aluminum PreClean then follow up with the Flitz polish (paste or liquid) for a brilliant shine. Safe for use on glass, aluminum, fiberglass. Not for use on chrome, stainless steel or painted surfaces. Always test on a hidden area first. Use on fuel tanks, gas pumps, mag/alcoa wheels, diamond plate, framing, step plate, engine parts, water-stained windows, fiberglass boats, and more. 16 oz. spray bottle. Coverage is approximately 400 square feet. Made in the USA. Q. Are there any surfaces I should avoid, while using Aluminum PreClean? A. Yes, avoid contact with chrome, stainless steel, and painted surfaces.